I can see that. He's helped me out too by buying my HDS 140 GT when it is still under servicing with Henry, not for himself, but for a friend who has lost his 170 tactical. I am glad to meet so many nice guys here in CPF. The love of light is the reason why I don't walk in darkness. But darkness has it's beauty...Sadly, my lights are much more beautiful!! Precisely. Although I hardly needed anything more powerful than that for my EDC usage, I have to agree that more might be better. OTOH, I would rather much prefer it to have a lower low output than what is currently being offered. I am sure you feel the same Pete? My 119 Haiku is bright enough for almost anything I do, but today I was trying to see up underneath the gutter on the greenhouse to attach some heat pads and even with the light on high, it still wasn't enough to overcome the bright sunlight. Finally got it done, but should have done it in the morning when that side was still in the shade. I'd love to eventually see a 4S engine from Don, with the Haiku going both higher and lower than present, but with the 3S, wish that there was just a bit more space between levels so that the low went at least a bit lower than present. I think low is now 4lumens, and would like to see it at least brought down to 1 or 2lumens. Probably never happen, but I'm still hoping. yeah a haiku with a moon mode would be perfect. The low is too damn bright on my haiku. Email has been sent. Let me see what you LED guy's have been up to. Thank you, Don, for the awesome light. Only one problem though; I'll never be able to look at lights the same as before this one. When I joined CPF five years ago, I never really paid any attention to the custom flashlights because I knew I would never be going there. Bad mistake, should have been the first place. Now I need to figure out what I'm willing to sell. Thanks again! Glad I finally seen the light. Hey guys, I was just wondering how come the cusom lights dont usually have HI Lumens like 500-700? Usually when I see a custom light it is 80-200 or so? Is there a reason or just thats the way it is? Many of the custom builders ( Don being a perfect case in point) are concerned with not only making a light that looks pretty, but is reliable and tough and can be depended on day after day. Conservative outputs increase runtimes and preserve the health of the emitter, leading to greater longevity and functionality over the life of the light. That's my take anyways from reading a lot of Don's posts. Edit: Mac breaks the mold a bit in this regard. He's kinda a lumen junkie. One last question. Anyone know how tall the Haiku 1xcr123 stands? It is 9.4cm or 3.7" to be exact. Hey guys, does anyone know how to get the Metal (Ti?) 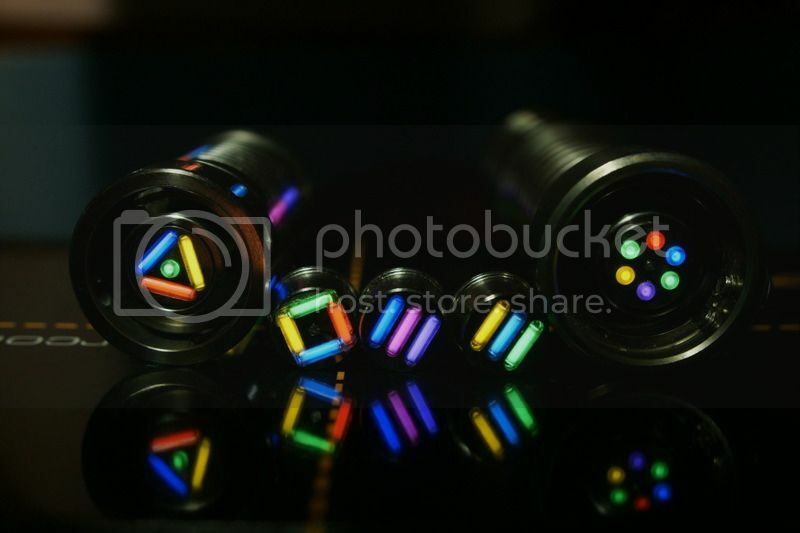 tail cap with tritium for the Mcgizmo lights(Haiku XML)? During the day when I don't need a torch ... RC is my hobby http://rc.runryder.com/helicopter/gallery/47842/Always on the lookout for McGizmo/Kuku Titanium torches with Trits..
You won't regret it, especially on your camping trips. thanks don! payment was just sent. I know you have put alot of thought in your decision. Happy for you. You won't be disappointed. It's arrived! albeit 2 days late than tracking said it would but it came this morning and I am more than pleased! Thank you Don! Last edited by Karasu; 08-29-2012 at 08:11 AM. Reason: update! Is is possible to directly order a Haiku High CRI already fitted with tritium locators? Many thanks Don for getting my light build made and shipping on such short notice (I should have it before I leave this weekend). In regards to high output from an earlier question in such a small package I can state from the owner-end of one of the new Triple Copper E2 XPG's that high OTF lumens comes at a cost: run time and true versatility. According to which batteries you use, 1x18650 or 2x18350, high may give you bragging rights but heat and actual use time make the TC very limited. Beyond low and medium it becomes a "let me impress my friends" toy IMHO (for me). Love the E series that many custom makers have embraced but in my profession of the medical field and making yearly trips (out of pocket I might add...the hospital donates equipment and supplies but I pay my own way) to western China and the Tibetan Plateau and other destinations on occasion it is important that I have reliabilty at all times. I need a light that works! Period! I'll take 100 to 300 OTF lumens any day from such a small package over 1100 to 1600 for a very short run time before it steps down, shuts down or sets me and my fellow co-workers and equipment on fire (although the warmth factor might come in handy in such a cold climate). Reasons for going: My beloved wife who is originally from Tibet and INSANITY I'm thinking! Look to the adobe of the devil. For my brothers and I have been there. Ordered earlier today. Very excited. Haiku Hi CRI head arrived. That's interresting. Could you elaborate on the switch ? Does it have the same feel as the original McClicky ? With momentary "on" then a click further down for constant "on" ? The point of the 3S UI is fast and easy level change, does that hold true with the kuku switch ? E mail sent for 1 High CRI head. To a democrat freedom means freedom from responsibility. Thanks for the quick response, Don. Payment has been sent. There is a Sapphire on the way but I can not stop looking at this Haiku, I hope i can hold of ordering untill the Sapphire is in, customs charges can be quite a pain in the nethers. The light is just too handsome, this close to buying, kudos on this and the other lights Don. I couldn't resist any longer. Had to order one of these. My HCRI Mule needed a companion.